Also refer to Chart No. 10 in Book 3, 'Polarity Therapy' and pages 62, 63, 64, 65 & 66 therein. The principle and application are fully explained there. 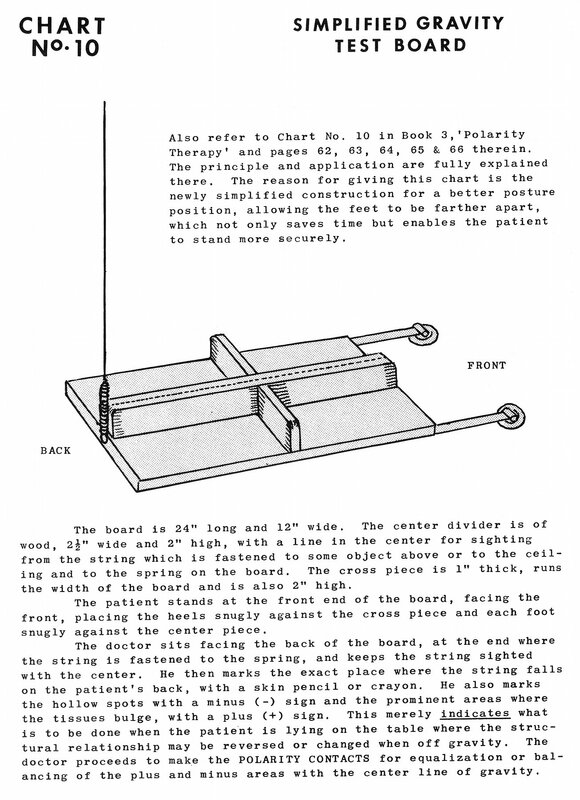 The reason for giving this chart is the newly simplified construction for a better posture position, allowing the feet to be farther apart, which not only saves time but enables the patient to stand more securely. The board is 24" [twenty-four inches] long and 12" [twelve inches] wide. 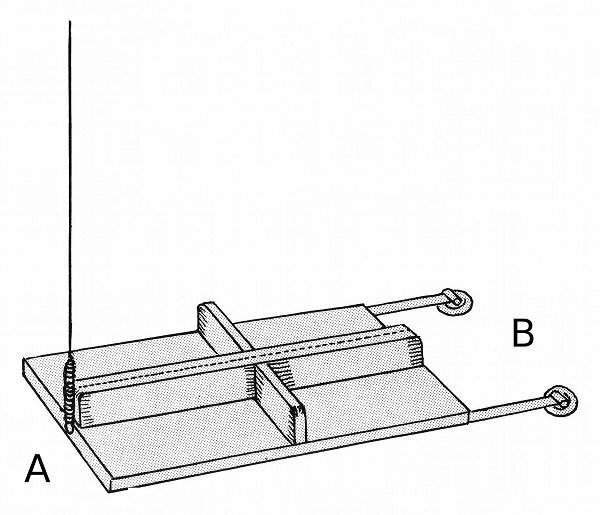 The center divider is of wood, 2 ½" [two and a half inches] wide and 2" [two inches] high, with a line in the center for sighting from the string which is fastened to some object above or to the ceiling and to the spring on the board. The cross piece is 1" [one inch] thick, runs the width of the board and is also 2" [two inches] high. The patient stands at the front end of the board, facing the front, placing the heels snugly against the cross piece and each foot snugly against the center piece. 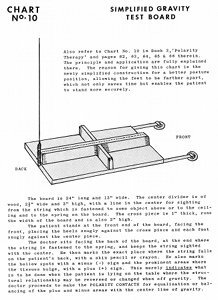 The doctor sits facing the back of the board, at the end where the string is fastened to the spring, and keeps the string sighted with the center. He then marks the exact place where the string falls on the patient's back, with a skin pencil or crayon. He also marks the hollow spots with a minus (-) sign and the prominent areas where the tissues bulge, with a plus (+) sign. This merely indicates what is to be done when the patient is lying on the table where the structural relationship may be reversed or changed when off gravity. The doctor proceeds to make the polarity contacts for equalization or balancing of the plus and minus areas with the center line of gravity.